Sometimes I like to feature recipes that did not travel too far, like this one. I went for dinner at a Basque restaurant in San Francisco a few nights ago and one of the dessert item was “gâteau de maïs à la compote de fraises“, cornmeal cake with strawberry compote. Then I realized that there is an Northern Italian cake that sounds just like this one, but I decided to skip dessert since I had a filling appetizer and entrée. I will have to go back and check out the Basque version now! Everyone knows savory polenta, but there is another sweet version that a few people know, la polenta dolce. Well, if polenta dolce (sweet polenta) is a less famous way of preparing polenta, it is certainly not less delicious. In Lombardia (Milan, Brescia and Monza are the biggest cities) dessert based polenta are not that rare, and this recipe is a typical Lombard dessert and a good member of gastronomia Lombarda. It makes sense, since those regions produce a lot of polenta, when you drive through this area, you see so many corn fields, it’s so obvious that the production and consumption of polenta is high in these areas. I made a few changes to the proportions but the ingredients are what they’re supposed to be. A good friend of mine from Milan used to eat soft polenta cooked in milk with raisins and sugar and my mom would look at this with a suspicious eye, thinking those people from the North eat funny things. Many Northern regions such as Friuli, Venezia, Piemonte do have their own versions of Polenta dolce and some other polenta-based desserts, but I somehow like this version with almond powder (or flour) and marsala, but if you like cherries, you can also use maraschino which is a Venetian liquor made with cherries (and also available in the US). You can serve it with any accompaniment you like, I love strawerries and rhubarb compote so much that I can eat it with anything, yogurt, ice cream, cakes, etc…and with this polenta cake it works perfectly. These polenta cakes are delicious, and can be eaten for breakfast as well, they’re not very sweet nor greasy and very hearty. Melt butter and in a mixing container combine with sugar. Mix well with an egg beater. Add eggs and mix well for about 10 minutes. Add the rest of the flours carefully, and vanilla, marsala (or maraschino) and baking soda. Divide in 6 individual molds or a large one. Cook for about 30 minutes in a 370F pre-heated oven. Let it cool and serve with a berry or fruit compote. This entry was posted by silvia on April 19, 2010 at 8:59 am, and is filed under Breakfast/Brunch, Desserts. Follow any responses to this post through RSS 2.0.You can leave a response or trackback from your own site. Strawberry- rhubarb compote is one of my favorites and your polenta cake looks pretty good too! One of our favorite Basque family restaurants in North Beach, SF was called Des Alpes, they had the best soup! I’ve never tried rhubarb is it sweet? I’ve seen it at the market but was not sure how to use it. I love polenta cake and make it fairly often, never with rhubarb however. This is a great idea1.Perfect for spring. I have heard of sweet polenta cake, what a great addition with the compote! I also love the presentation! 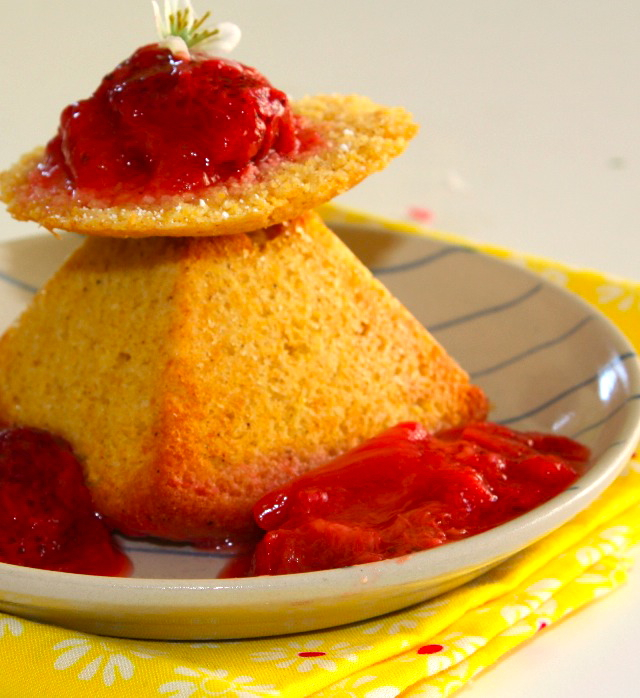 This sweet polenta cake sounds wonderful and so perfect with the rhubarb and strawberry compote! An excellent dessert for spring time! Oh, how we would love this in our house! The polenta cake is something just different enough to be really interesting and strawberry-rhubarb is one of our favorite fruit combination. I love polenta. It takes up flavour like a sponge. this is a really creative way of presenting polenta. Your cake looks wonderful. Nice presentation! Polenta is something I can’t find here. So, I have to drool over this right here! Oh, you gave your cake a flower hat! Nice! Wow, those look great, another use for my polenta, thanks! Sounds wonderful! I’ve been loving strawberries and rhubarb together this spring, and the polenta cake sounds perfect for them. I love the combination of strawberry and rhubarb. They were made for each other. I shall have to try this! Fantastic presentation. I’ve never seen a polenta cake. Perfect with strawberries and rhubarb! C’est marrant! Je suis tombée sur cette recette, histoire d’aller voir ce que tu fais dans les douceurs et je viens juste de recevoir un moule en forme de pyramide pour justement faire une pâtisserie arabe! J’adore ton gâteau d’ailleurs je suis folle du polenta, sucré ou salé. Merci de spécifier l’endroit d’ou il vient; mon arrière grand-mère était originaire de Trieste et ma tante m’a dit qu’elle parle un italien venitien; bref, tout ça m’intéresse et ton site est une vraie cave d’Ali-Baba! Heck yeah. Anything with polenta has me at hello, and the strawberry-rhubarb just seals the deal. Love this recipe, and would love to see it on the linky party I’m hosting tomorrow on my blog (featuring strawberries as an ingredient). Join!